The synopsis of the plot intrigued me, especially the "freak weather disturbances" phrase. 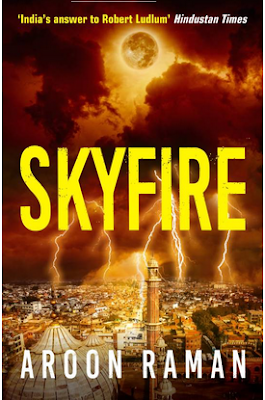 Skyfire by Aroon Raman is a fast-paced thriller which links various issues from child kidnapping to weather change. Right from the first chapter, the suspense builds up at a steady pace, leaving many ends loose until it all ties up together towards the end. The author deserves credit not only for keeping up the interest levels of the reader but also taking the time to explain a scene and build up the narrative. I haven't read his earlier books but references to Shadow Throne in a few places in this book made me want to pick it up soon. It is difficult to write a review without spoilers, especially for a thriller novel. But I'm proud to say that I guessed the negative character right, somewhere around the middle part. Maybe, there is a bit of Meenu in me! :-) She is my favorite character in the book - her strength lies in figuring out missing pieces of the puzzle at critical junctures that other two lead characters might miss easily. The only area where I felt the author could have done better was that some of the gory descriptions and violence could have been avoided. If you'd like to read an interesting page-turner, I highly recommend Skyfire. And make sure, you have some uninterrupted time on a weekend afternoon to finish this book in one go. P.S. The book was sent to me by Flipkart as part of their "bloggers initiative". The review is my honest and unbiased feedback of the book. How to glow from within?